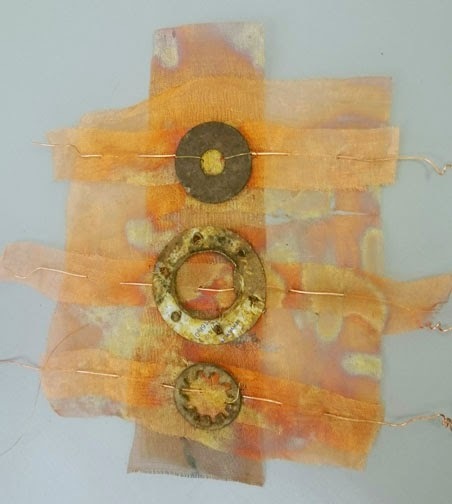 Experimental Textiles - session 8 - Students choice! One of Val's samples from the 'Backgrounds and Pretties' technique. 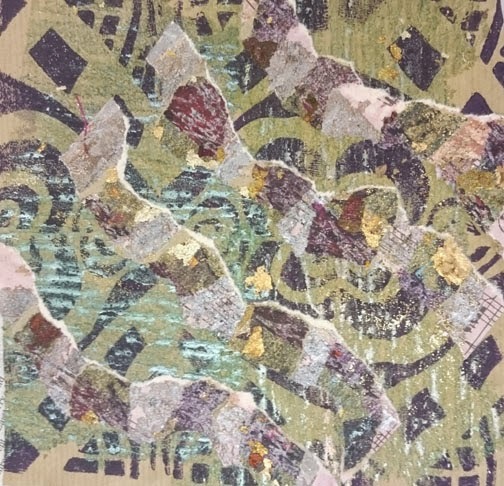 Session 8 of Experimental Textiles is a student choice. The groups negotiate with me what they would like to do - I become their resource. Half of the Thursday/Friday group wanted to catch up with workbooks and the other half wanted to try my 'backgrounds and pretties' technique. The Saturday/Sunday group just wanted do the 'backgrounds and pretties'. But first it was time to look at the homework - this takes longer every session. It is a great opportunity for the groups to discuss the work with each other. We had a great laugh when Kate brought in 'It'. We have christened it 'It' as we already have a 'Thing' by Rachael. 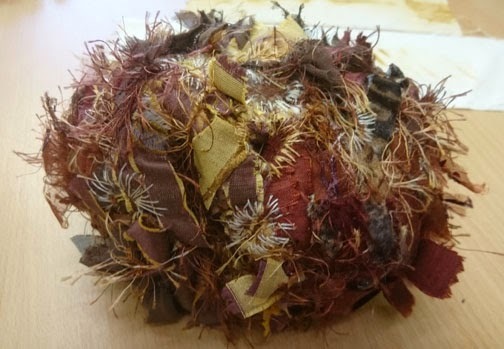 'It' started life as a weaving supported on chicken wire that became rounded at Kate worked on it. 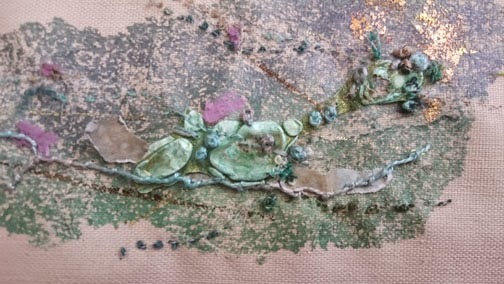 She decided to make the piece totally enclosed and started to stitch into 'It'. 'It' is going to be heavily stitched, something that Kate enjoys doing in front of the TV. The joy of this type of work is that it isn't meant to look like anything. It just develops as you work. 'This, 'That' and 'The Other'!!! On Saturday the weekend group showed their homework, most of them had seen 'It' on Facebook and were aware of the hilarity that had occurred when 'It' was unveiled. So it was with great aplomb that Alison introduced us first to 'This' and then 'That' and then, to roars of laughter . . 'The Other'. It is at such times that you know the groups have formed well, know each other - and me, very well. 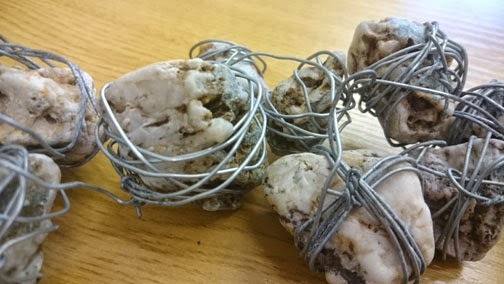 Kate's homework also consisted of an interesting piece made of stones and wire. 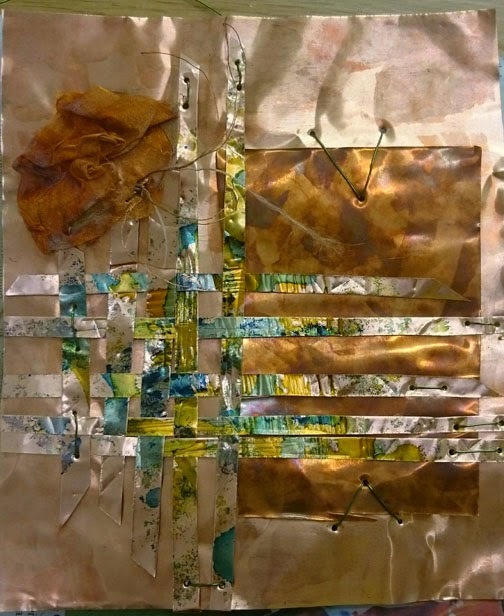 Kate also developed a piece that incorporated Tyvek - very well. 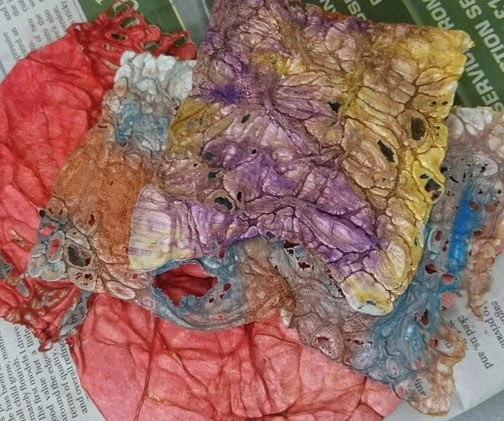 Those of you who have done workshops with me that have included working with Tyvek, will know that I always warn that is has to be well disguised or it is too 'obvious'. 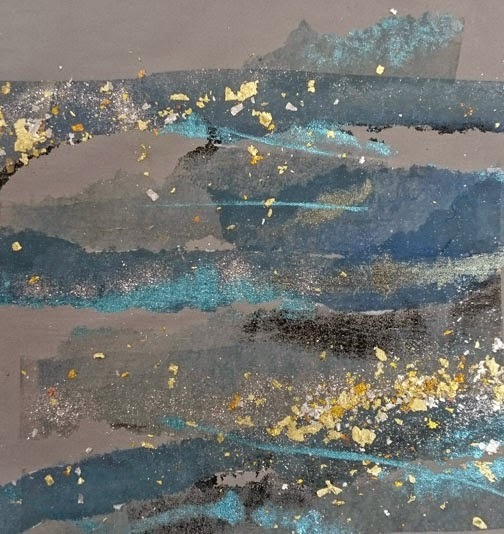 Kate's work showed, very beautifully, how this can be done. I haven't taken many photographs of the home work as I don't want to spoil the 'reveal' when show the groups work at their end of year show at the NEC next month. The groups are working well, with each student working confidently by themselves. This is what I aim for, and am always so happy to see. 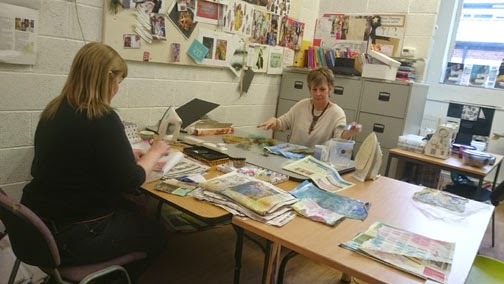 The weekend group working happily away - Val, Mary, Melissa and Alison . .
. . . and Trisha and Rachael. Val playing with her papers. 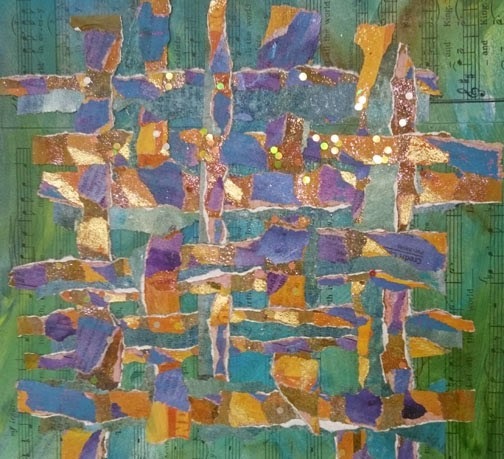 Mary is working on a quilted version of her 'Journey', it is remarkable. It is unlikely to be finished in time for their show, but there will be enough done for you to appreciate it. Mary and Val are doing the year again, they felt they needed more time to play and develop. It's not until you have finished the course that you realise you are really just beginning. I have booked out five weekends over the coming year so that students finishing this year can carry on working with me - I will take on more of a mentoring role. 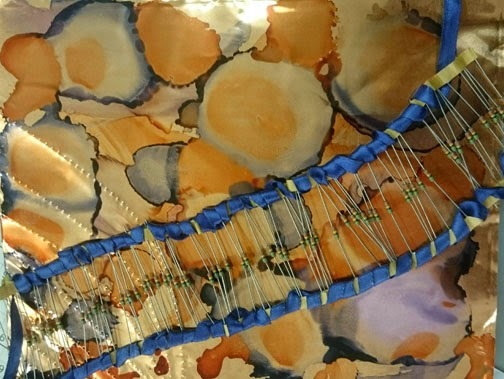 The group will be open to all ex Experimental Textiles students. It is my hope they will become an exhibiting group. Students finishing the course can choose to do the year again or go onto 'ExTeXtra'. 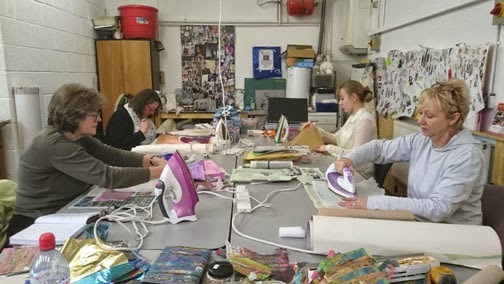 It never occurred to me that a student might want to do the course again, but it has been very successful, helping to build confidence and further develop their personal 'style'. Kate and Marilyn of the Thursday/Friday group . .
. . and Caroline, Kate, Suzie and Jane. Most of the students wanted to play with my 'Backgrounds and Pretties' technique. It a very relaxing technique as what you are layering up doesn't really have to look like anything - you are 'designing through process'. 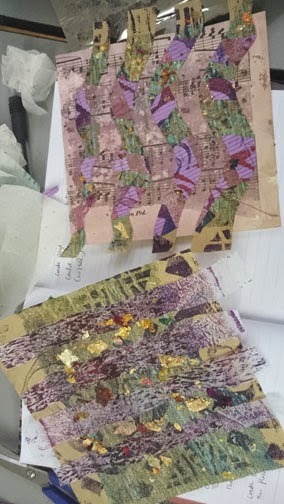 The groups had great fun playing with old papers and painted Bondaweb, along with gilding flake, glitter and transfer foil. 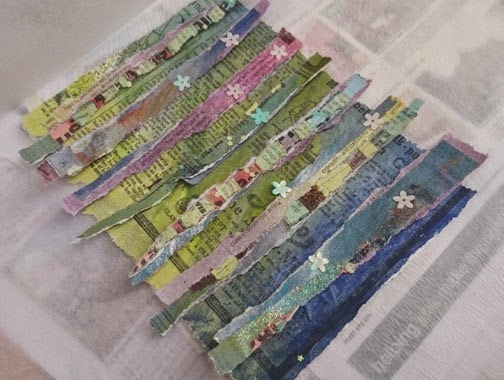 These papers can then be ironed onto a suitable weight of iron-on interfacing for stitch, book covers . . jewellery . . This was Caroline's table at one point on Thursday. The workbooks are always the stars of the students exhibition, the students put their heart and souls into them. 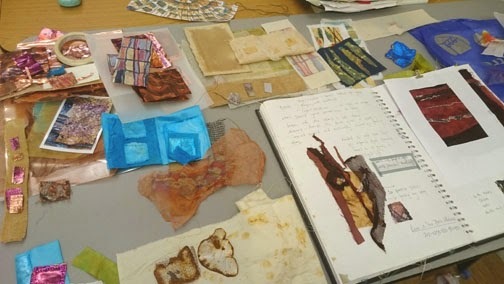 Running Experimental Textiles as a non accredited course means the students don't have to tick boxes, I can work with each student and help them develop individually. The workbooks are not compulsory, I suggest the students keep them up, (and write them up) and boy do they. The standard is far higher than other courses I have taught that were accredited. 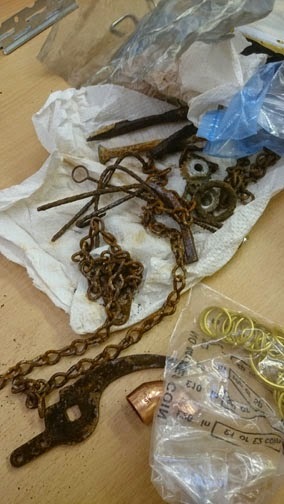 Some of Caroline's metal samples. So - next week will be the final session for both groups - there will be lots of talk. Discussion on what I will choose to hang in the exhibition. How things have gone - how they will progress. I always stress to students that the course is for them. It is up to them whether spend their time developing samples or make a finished piece for the show. I support them in whichever choice they make. There is some fascinating work in the pipeline, I am VERY excited. My problem will be having to choose only two or three pieces of work from each student - there wont' be enough room for more. It will be very hard to choose. I am starting to clear my studio, the first in a long line of clear outs ready for my move in the summer. I have decided to delay putting the house on the market. I will wait to have my knee done - then do it. Not even I can do everything at once!!! 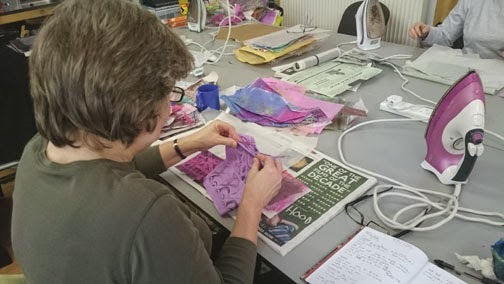 I am teaching a one day workshop on Saturday in Newbury for the Embroiderers Guild. It's one I had to postpone from a year ago. It's Scrumptious Spunbond (Lutradur) - we should have a great time playing with heat guns and soldering irons. I will report back. Have a great weekend - when it gets here. 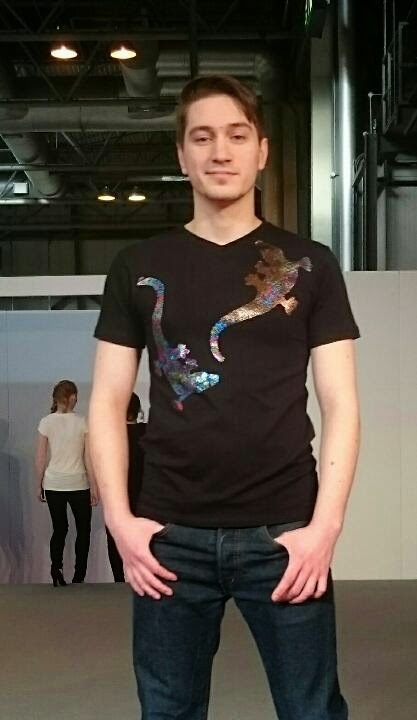 One of the lovely models showing off my gecko t. shirts. 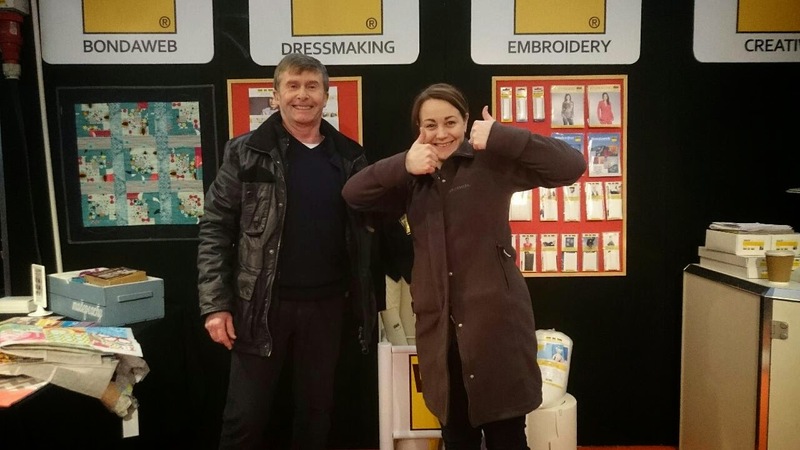 Craft, Hobby and Stitch International is a trade show. 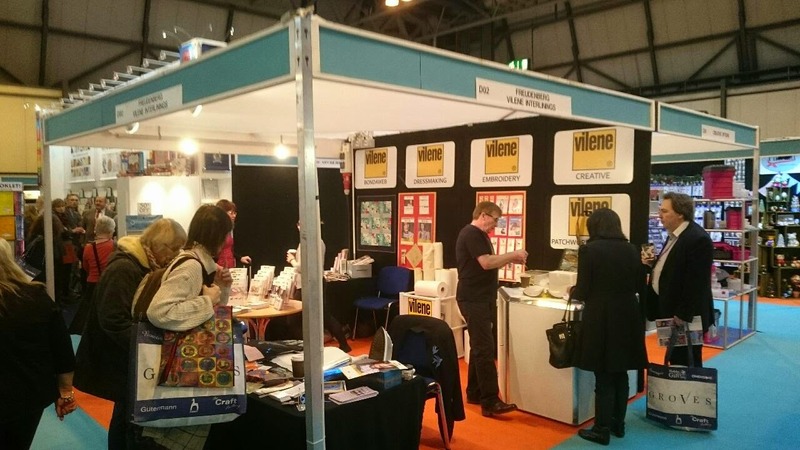 As I work with Vilene as a consultant, I work at this show and run their retailer workshops. This is a very sedate style of show compared to the consumer shows that I do. Vilene have decided to bring Hot Spots into their main retailer range - as you may know, I have been selling Hot Spots on www.nid-noi.com for several years. I sell them by the metre, Vilene will be selling them in pack of 5 x A4 sheets. Hot Spots are a bit like a spotty Bondaweb but with a heavier backing paper. 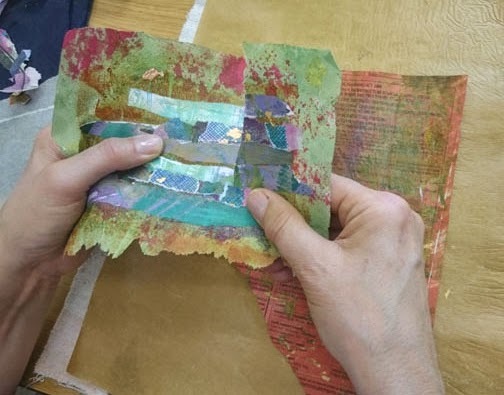 Because the backing paper is heavier, the Hot Spots can be cut with hole punches, die cutting machines and laser cutters . . as well as scissors! 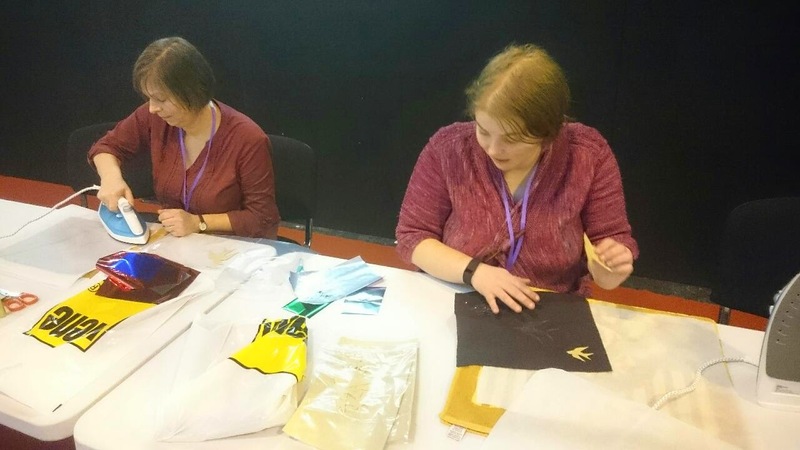 I was asked to decorate T.shirts for everyone on the trade stand this year, so I asked my friend Claire from lasercutsussex.co.uk to help. Claire's knowledge of laser cutting is amazing. You may remember that she cuts my jewellery for me? A pile of Vilene retail logos ready to foil. Claire sorted the design on the computer and then laser cut the logos one at a time from single sheets of Hot Spots. The logo cut from Hot Spots pressed onto the T.Shirt. Once I got home I fired up my heat press and pressed the logos onto the front of the T.Shirts. (Using baking parchment) Once the backing paper was cold I removed it to reveal the clear spots of glue. 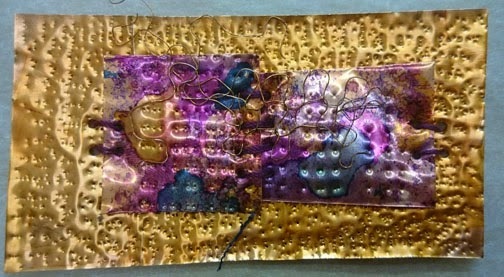 I then laid gold transfer foil over the spots of glue, then baking parchment and pressed the foil with the heat press. This can easily be done with an iron. Hot Spots come in small and large sized spots. I used the smaller size for the logo as I wanted a good definition of line. Chris and Laura setting up the stand. We set up the stand on the Saturday ready for the first day on Sunday. The show starts at 9am and finishes at 6pm - it's a long day. The stand in full swing. As I said - it is all very sedate. Business people wafting around in suits. It's all very calm. 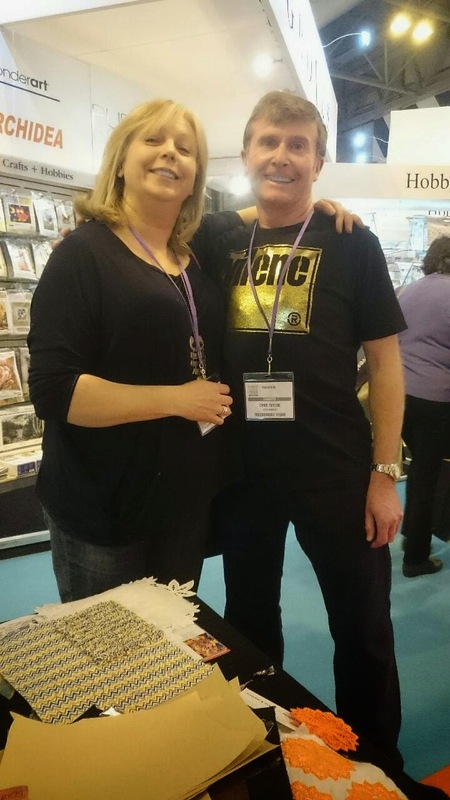 Unlike Fashion, Embroidery and Stitch at the NEC next month - that will be mad - fantastic - but mad!! From the left - Per from head office in Germany, me, Laura and Chris in our gold foiled T. shirts. The retailer workshops are for 20 retailers and run for 45 minutes. Laura and I taught one every day on how to use the Hot Spots. Claire had cut lots of birds on the laser cutter for me so we had plenty to play with. 2 of the retailers playing in the workshop. 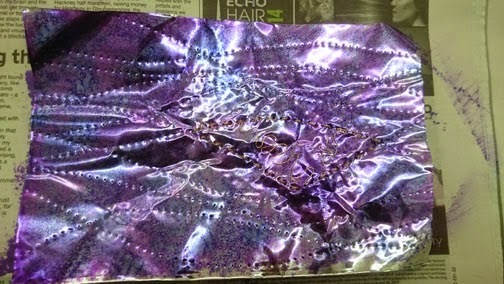 Hot Spots cut into gecko shapes and foiled. There is also a fashion show at the trade show - 2 or times a day. 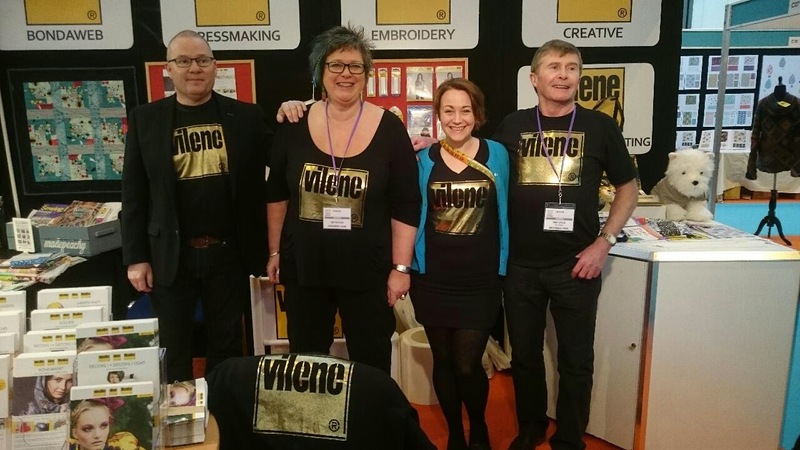 Vilene had some garments sent over from Germany - that didn't arrive. So I had rustle up some T.shirts quickly. 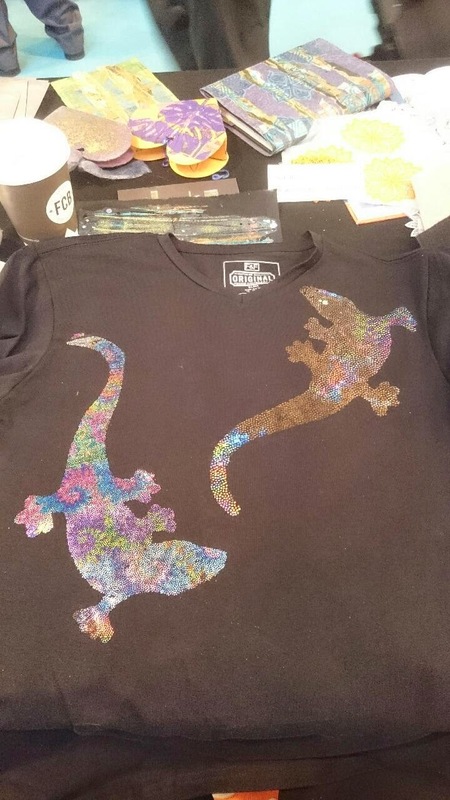 I cut some of my geckos from Hot Spots and rustled up a few samples for the fashion show. 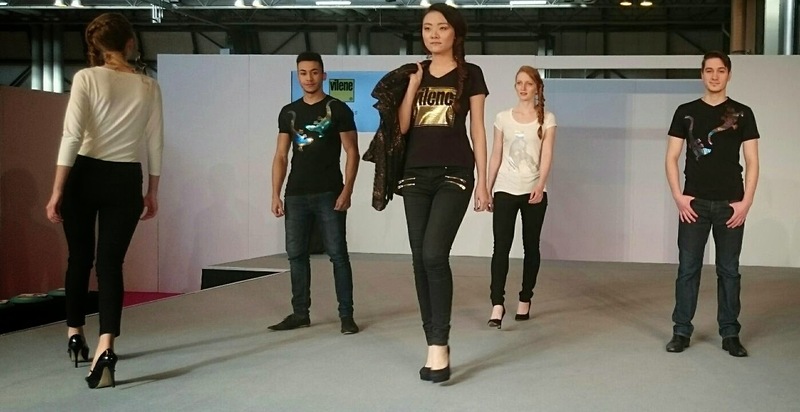 The T.shirts on the catwalk. The garments not turning up did do me a great favour. The T.shirts went down very well. In fact they caused quite a stir. 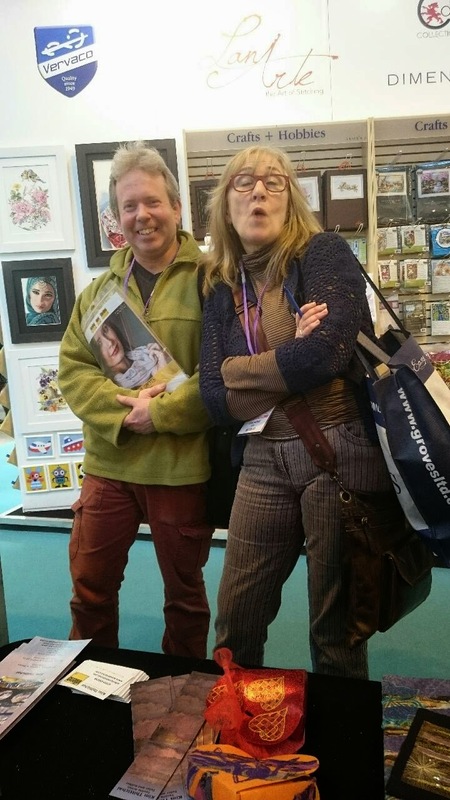 We had lots of visitors on the stand including the lovely Hilary Beattie who was on very good form - as Chris discovered . . .
And it was good to see Viv and Kevin from www.artvango.co.uk. Do have a look - it's very easy to use and the site is full of delights. Viv and Kevin from Art Van Go. 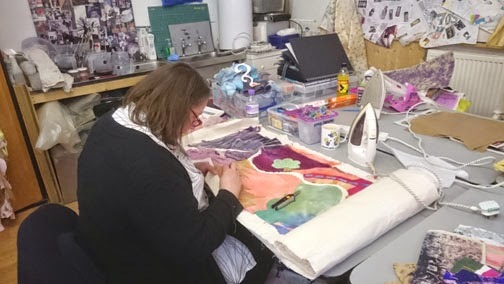 I am now in Redditch at the IDC studios teaching the penultimate sessions of Experimental Textiles. 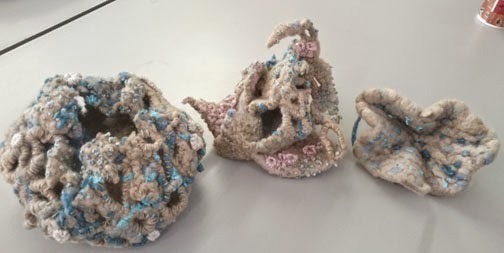 The students are creating some amazing work - I am very excited. Their end of year show will be at Fashion, Embroidery and Stitch Show at the NEC, March 19th - 22nd of March. 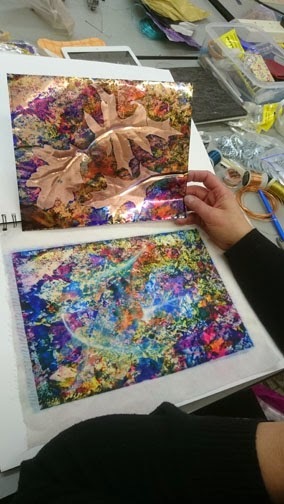 We are now enrolling for the next course which runs from in June 2015 - March 2016 - details can be found here - http://www.experimentaltextiles.co.uk/. 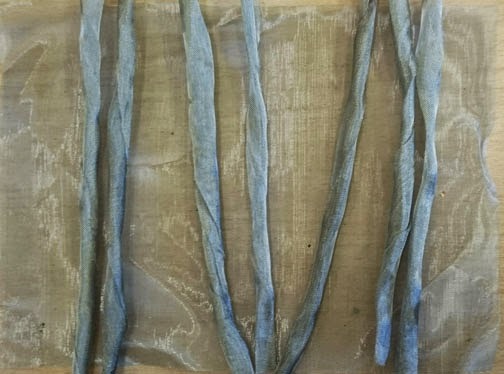 Sessions seven, eight and nine of Experimental textiles are students choice. These sessions are negotiated within the groups and with myself. 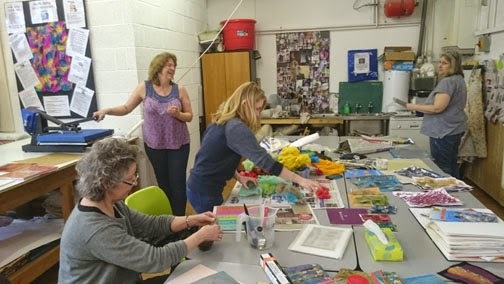 The groups decided they would like to work with metal on the first day of the session and have a go at working with painted Bondaweb and Tyvek on the second day. 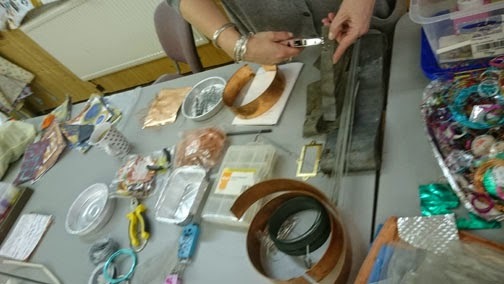 The girls brought all manner of metals to experiment with, and I supplied various wires and mesh. 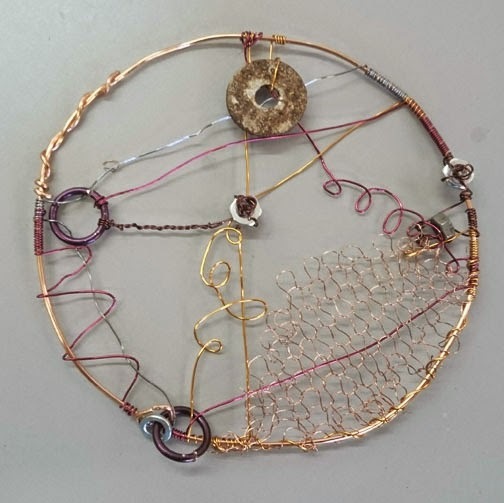 It is important that the students learn to work with resistant materials as well as fabrics and thread. The contrast of hard and soft can set off great ideas. 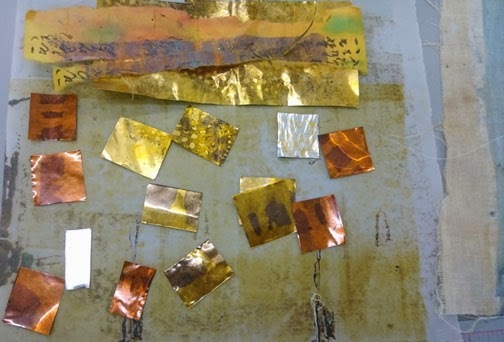 Copper sheet that has been transfer printed. 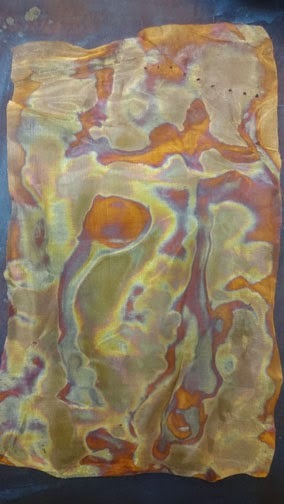 Alcohol inks were used to colour this copper sheet. 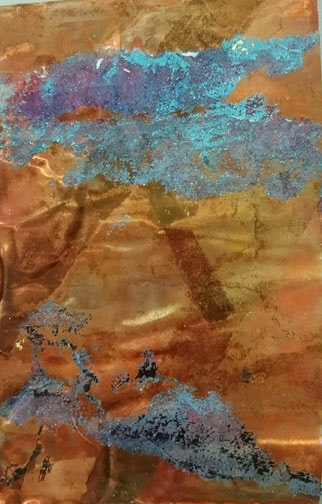 2 pieces of copper sheet, both textured and coloured with alcohol inks. 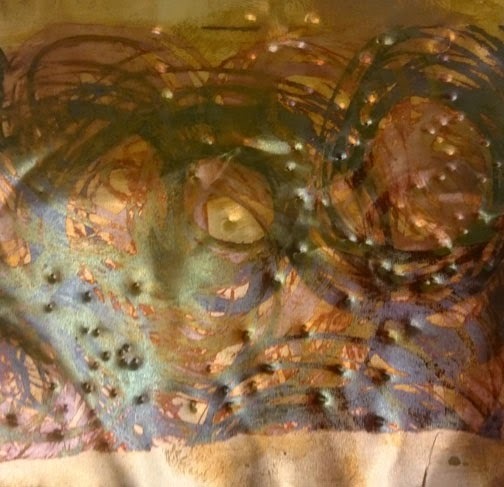 Transfer printed copper sheet that has been embossed. 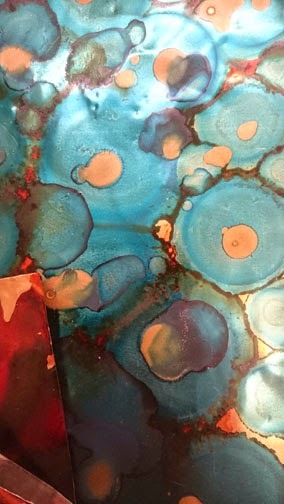 Alcohol inks . . .
Copper mesh heat treated and wrapped around a piece of lead. 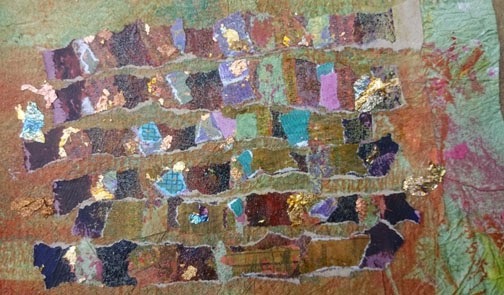 Strips of transfer printed copper woven and stitched onto heat coloured metal. 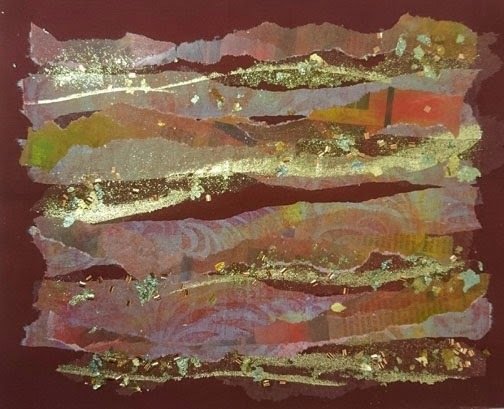 Strips of heat coloured copper mesh stitched together with wire and decorated with metal washers. 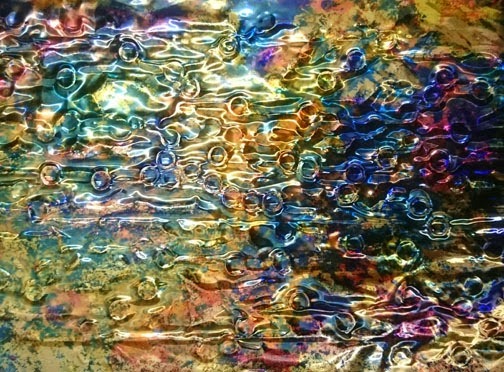 Copper sheet decorated with painted Bondaweb. 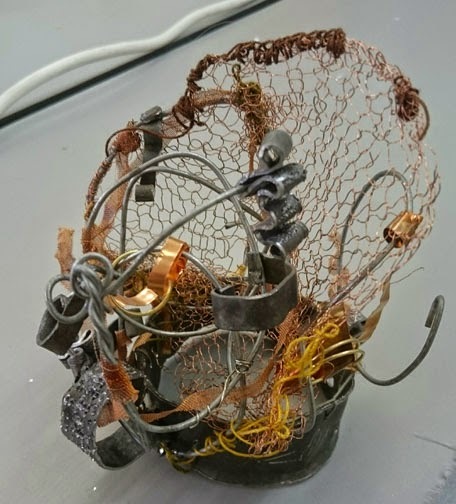 A sculptural sample made from lead, copper mesh and various wires. 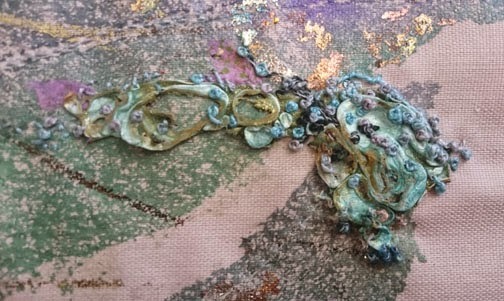 Transfer printed copper metal that has been distressed with a bradawl. We also had fun distressing Tyvek. 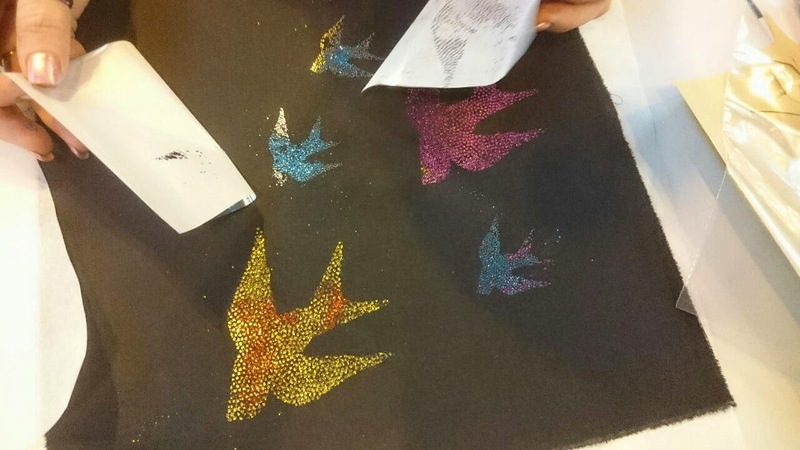 We also had a play with painted Bondaweb, on paper and fabric. It would be rude not to . . . . Painted Bondaweb on a grey fabric with gilding flake and blue transfer foil. 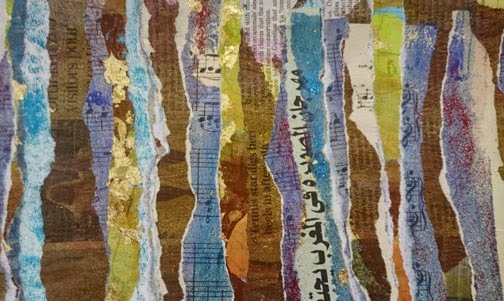 More painted Bondaweb, transfer foil, gilding flake and strips of paper. We have session eight over the next four days. 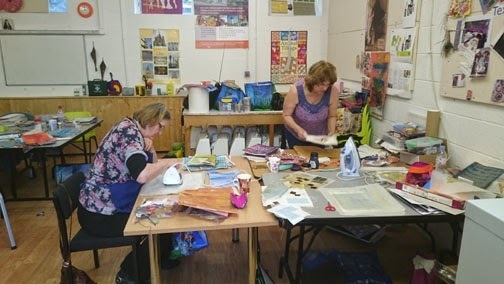 We will be discussing mounting, framing and finishing work and the group will be working on their projects. They are working very hard, I am so pleased with how things are working out. I am looking forward to seeing what they have been up to. More next week. . . . .
New Zealand - The South Island - Bliss!